Ras malai flavoured donuts, easy donut recipe, baked eggless donuts without yeast,eggless donut recipe, baked donut recipe, Diwali special fusion desserts, kids friendly desserts,how to make ras malai flavoured donuts, donut recipe, rasmalai glaze for donuts. Simple and probably the bestest recipe for baked, not deep-fried donuts ( had to use the words from the source of the recipe- sally’s baking addiction), in Indian flavours, sounds too good to be true. Here , Ladies and Gentleman, we have two most popular desserts in donut form. Close your eyes when you are biting on to these heavenly beauties and you will be oscillating between Rasmalai/ Gulab jamuns and donut , before being transported to a dessert heaven ! Mawa ( Khoya) and Chenna ( unprocessed cottage cheese) are two festive ingredients reminding us of India’s probably two most loved desserts- Rasmalai ( or Rasgulla) and Gulab Jamuns ! 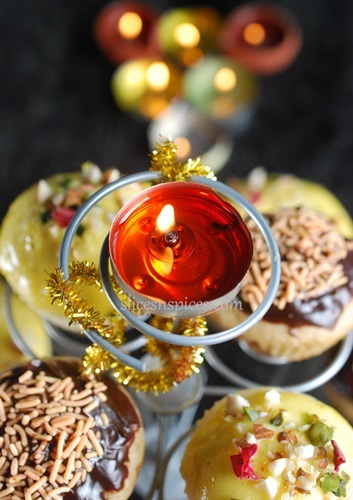 Come Diwali, and these sweets will almost always find a place in the festival day menu. Growing up, we weren’t much exposed to Rasgullas, and the only ‘good’ ones were from the sealed tins which had more syrup than the cheese balls. Gulab jamuns, usually made of mawa (Khoya) though were always the show stoppers on festival days, especially Diwali. Relocating to the land of Chenna sweets- Odisha, I have had heartful shares of Rasgullas and Rasmalais. Any sweet shop worth its salt will have some of the finest and softest varieties of these sweets. 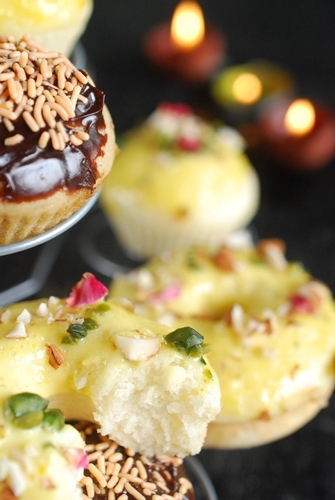 This Diwali, in a mood to whip up some fusion desserts, I included these two most loved Indian ingredients into the most popular western bake- ‘Donuts’. The recipe is an adaptation from one of my favourite blog Sally’s Baking Addiction. I have tweaked the recipe to make it eggless and added Chenna ( cottage cheese) in one variety , glazed with thickened rasmalai Milk ( Almond and saffron flavoured reduced milk) . The other variety has Khoya/ mawa ( reduced milk solid) with chocolate ganache glaze and sprinkles. 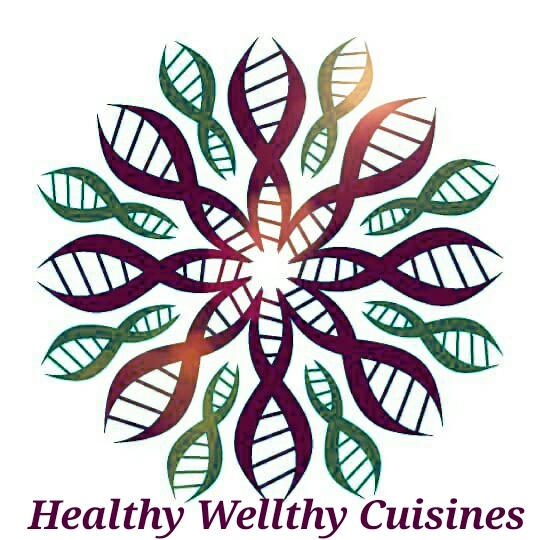 Please check the recipe for Baked Mawa Donuts here. 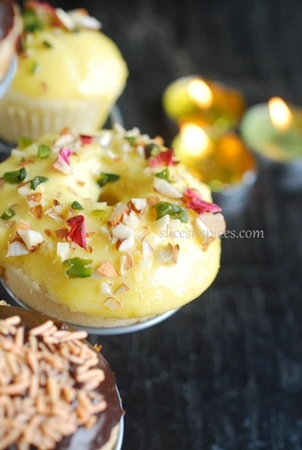 Recipe for Rasmalai flavoured Donuts. You can check the original version of recipe which contains eggs, here. In a bowl, sift flour,baking powder, baking soda, salt. Rub 2 tablespoons butter to the flour mixture to form a coarse dry mix. Keep aside. In a small blender jar, blend milk, sugar, chenna,curd to a uniform mix. Add saffron infused milk to the liquid mixture. Fold in the flour mixture into the liquid mixture and mix till it forms uniform batter. Bake at 180 degrees for 10 – 12 minutes till toothpick inserted at the centre comes out clean. Let the donuts cool for another 15 minutes in the tin. Loosen the sides of the donut with the backside of knife. Remove the donuts carefully from the pan and invert them on cooling rack.Once cooled store in airtight box. Note: It took exactly 12 minutes in my oven at 180 degrees C. So please check the donuts after 10 minutes and increase the time accordingly. If you do not have a donut pan, you can bake in cup cake moulds. Heat cream in a pan, keep stirring it intermittently. stirring constantly add saffron milk. Add sugar and keep reducing it. Mix a teaspoon of custard powder/cornflour mixed in a tablespoon of milk, add to the cream and mix continiously. Once the glaze thickens, switch off the gas, allow it to cool down. Just before glazing donuts, warm them for 30 seconds on high power in microwave. With a skewer, poke holes into the prepared donuts. Pour the glaze over donuts, sprinkle nuts and serve. 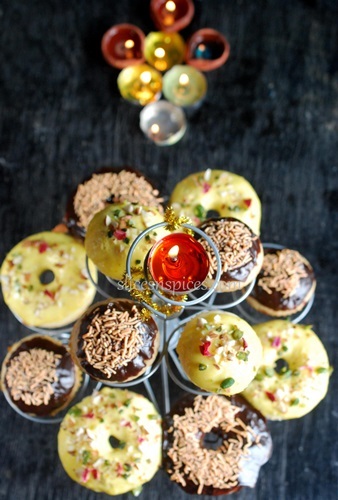 Check out the continuation of this post- Baked Mawa donuts here . 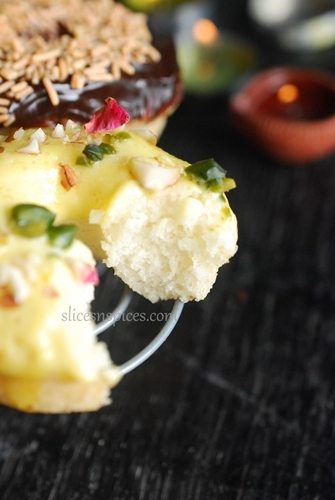 Tags: baked donut recipebaked eggless donuts without yeastDiwali special fusion dessertsdonut recipeeasy donut recipeeggless donut recipehow to make ras malai flavoured donutskids friendly dessertsRas malai flavoured donutsrasmalai glaze for donuts. Celebratory cakes- Slices’n spices turns two! Lovely recipe. Would definitely love to give it a try! The donut ingredients lists 1/3 cup sugar. When does it get added?